Dining at Noble Mansion at The Plaza makes one feel as though you’re in a traditional Chinese mansion. The restaurant is divided into a few sections – The Lantern, Bamboo Courtyard, Terracotta Rooms and Grand Hall – to enhance your overall dining experience. 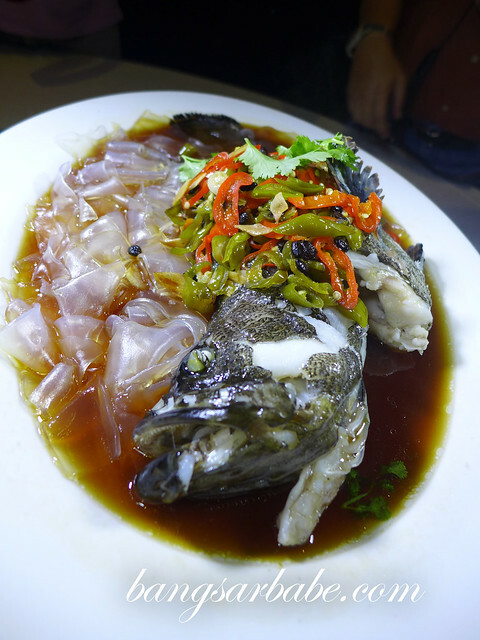 This latest restaurant by The Oriental Group of Restaurants showcases the latest creations by Chef Justin Hor, inspired by the delicacies of Shunde in Guangzhou, China. I rather enjoyed the smoky-sweet liver sausage roll, a specialty of Noble Mansion. 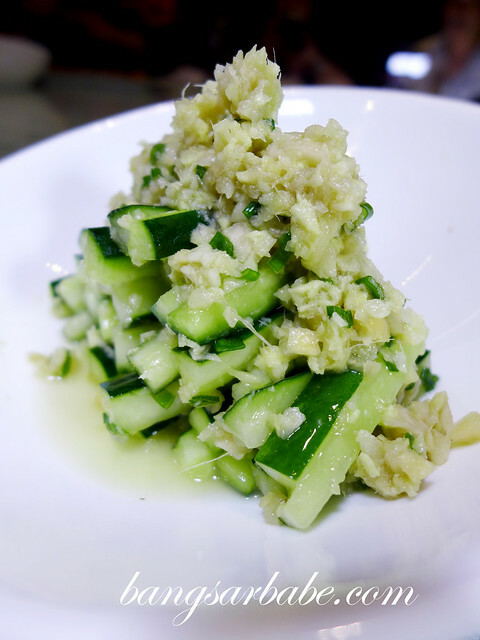 The zucchini with fiery minced ginger was definitely an appetite opener and a nice contrast from the anchovies in cincalok sauce. 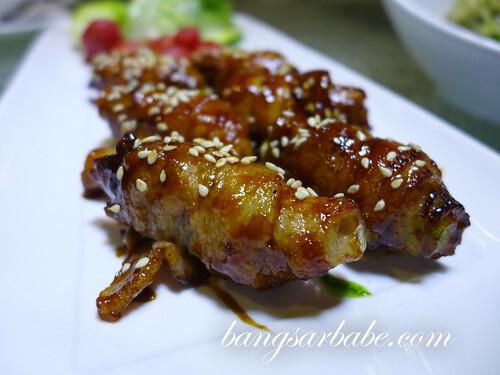 BBQ Pork Meat in Skewer was juicy and well marinated with lightly crisp edges. 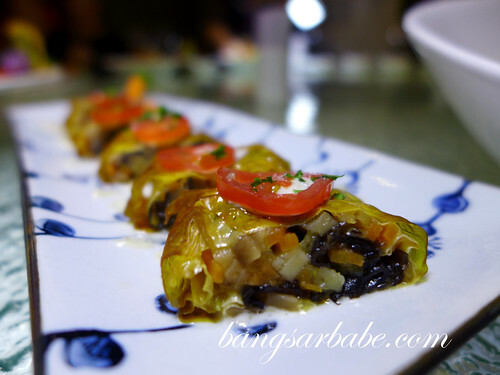 Next to it, the vegetarian spring rolls paled in comparison. 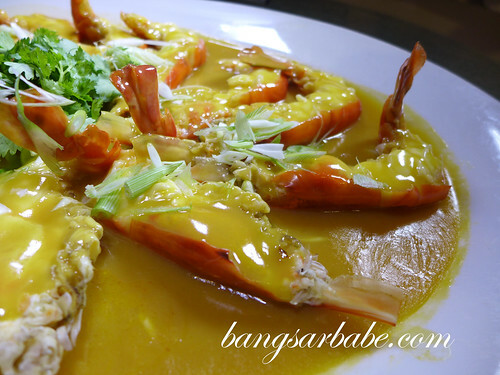 Steamed fresh water prawns happen to be one of The Oriental Group of Restaurants’ fortes, and this version didn’t disappoint. The prawn I got was succulent and full of roe – a pity it was just half. 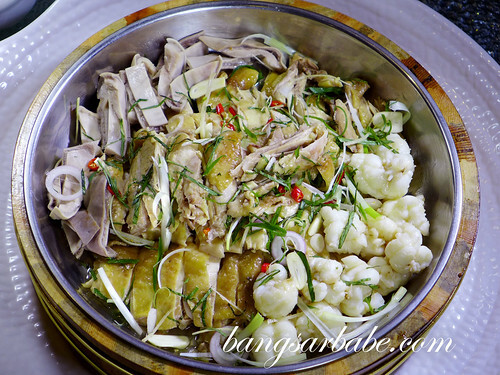 Another winner that night was the steamed ocean garoupa, prepared Shunde style. 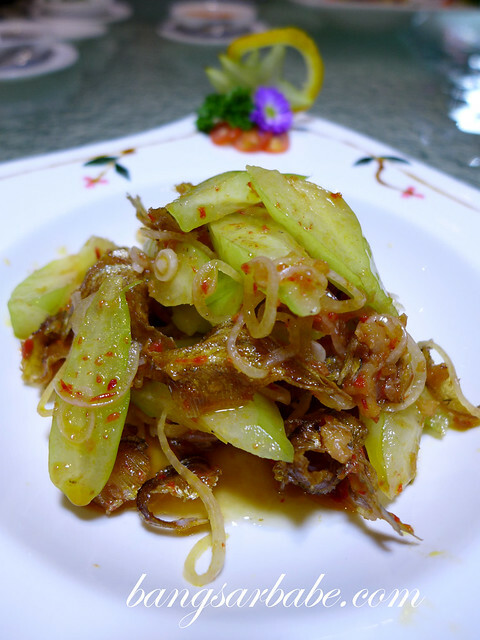 Chef Justin did it slightly differently with preserved radish and chilli for an added kick. The fish was cooked just right, resulting in its firm and smooth texture. 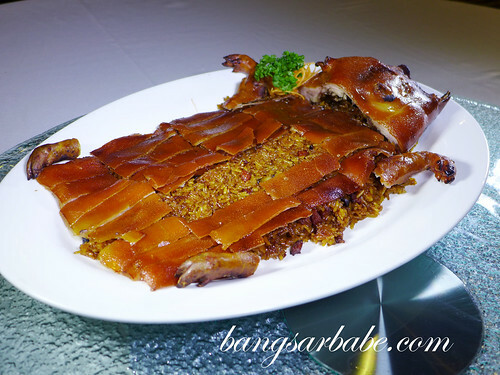 The famous suckling pig from Oriental Pavilion — there’s a 50% discount on this at Oriental Pavilion till the end of August 2013! The lobster with chicken & pig stomach in spicy sauce was also another favourite and rightly so. I wasn’t big on the pig stomach so I gave my portion away, but the chicken and lobster was delicious with the spicy sauce. Was very tempted to ask for white rice, but I needed (and wanted) space for the suckling pig. The suckling pig came atop a bed of glutinous rice, looking gloriously delicious. I found the rice fragrant and generously laden with tiny cubes of mushrooms and lap cheong. The skin of the pig was crispy with a slightly smoky flavour. 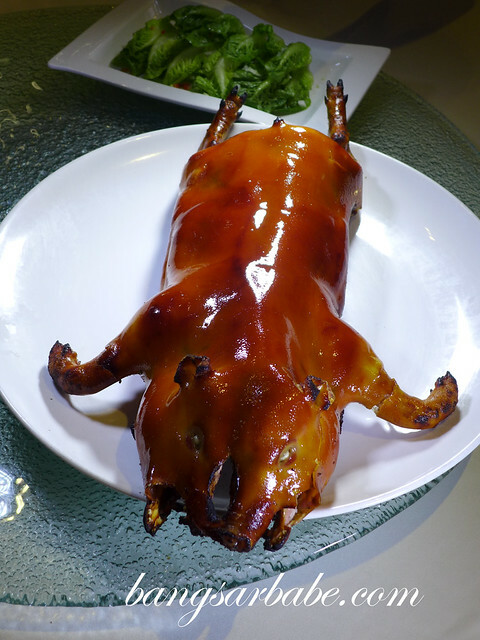 A bit different from the usual roasted suckling pig. 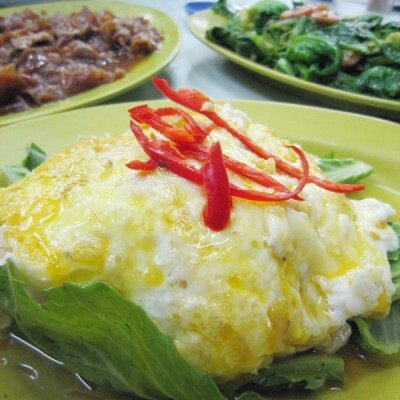 I love most things done “wat tan” style, so the braised wolfberry shoots with egg was right up that alley. This was simple yet tasty; my kind of comfort food. 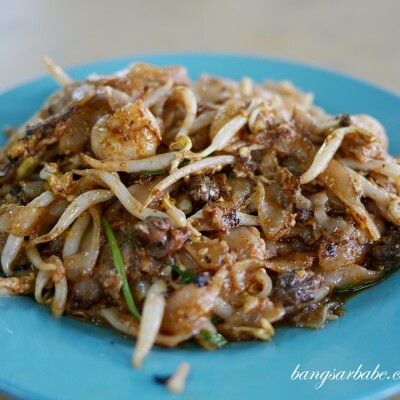 The rice noodle had a similar texture to mee suah and the abalone sauce was flavour packed. 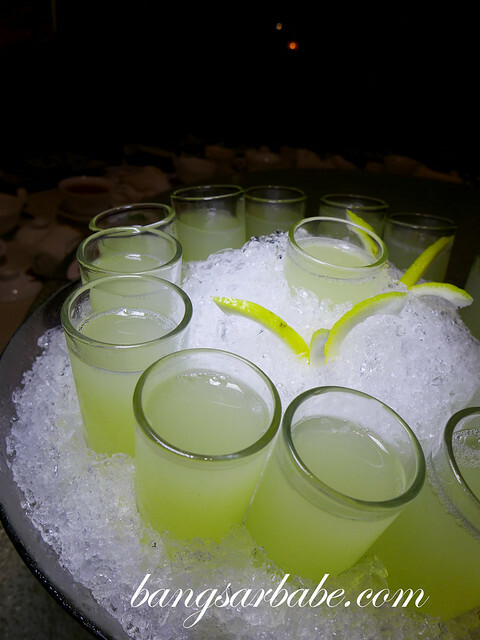 The chilled sweetened Fuji apple with snow jelly, gingko, fresh lily and red dates (RM13 per pax) was good stuff. I ate everything, including the Fuji apple bowl. 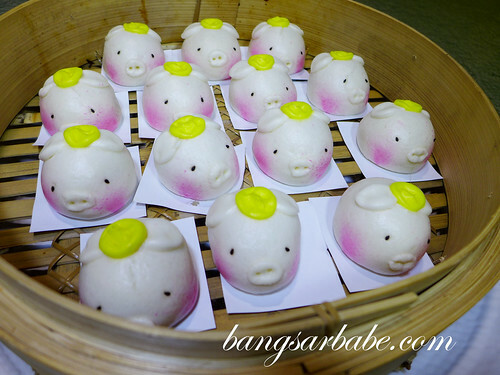 The longevity piglet bun was almost too cute to eat – this was simply a steamed bun with lotus paste inside. 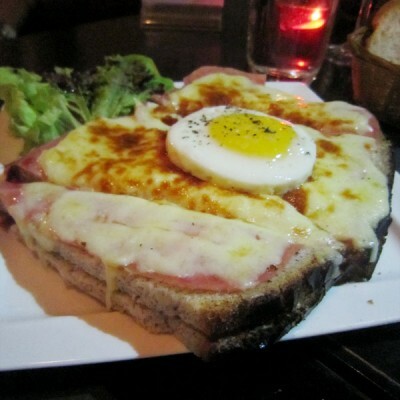 Nothing fantastic, but I’d order this again because of the presentation. On the whole, the food at Noble Mansion was pretty good. There are a few rooms complete with a karaoke set if you’re looking to host private dinners here. 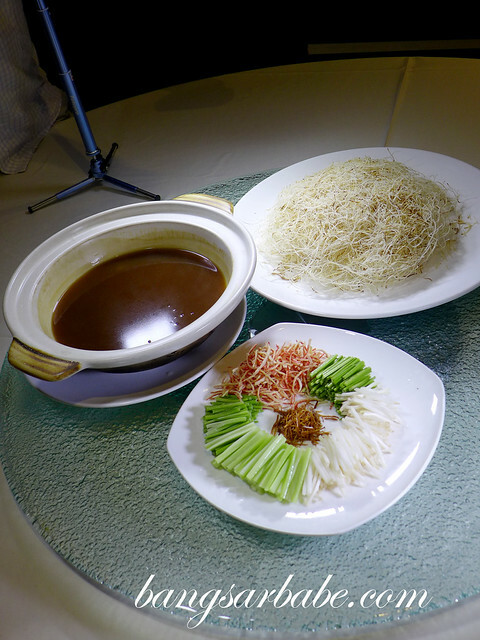 Dishes were different from the usual items from the other restaurant under The Oriental group, so the adventurous will be pleasantly surprised. For more information about Noble Mansion, visit The Oriental Group of Restaurants’ official website here. Also, “Like” Noble Mansion on Facebook here. 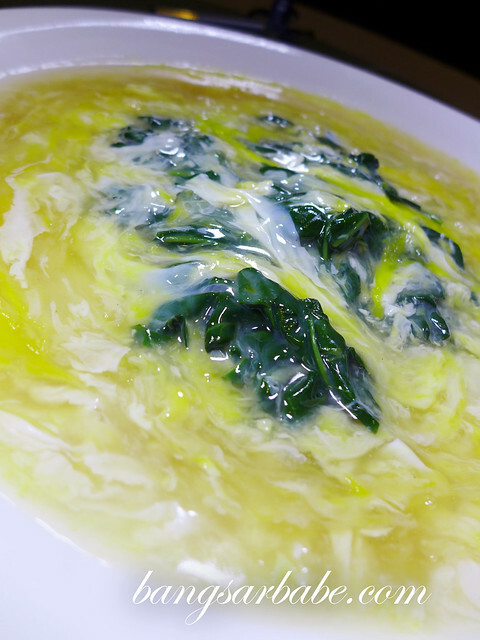 Verdict: If you want to know what Shunde cuisine tastes like, this is a place to go to.